Here come the dinosaurs running through the jungle. Rex must be hungry! 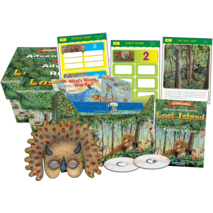 Pixies, dinosaurs, and wild children all live together happily on Lost Island. This tropical paradise is home to River and Pebble--two young siblings who live in a tree house, play with dinosaurs and have pixies as best friends.